I will be making an appearance at the San Diego Festival of Books on Saturday, August 25. Come out and see a bunch of great local authors and writers! Check out the links below for tickets and schedules. A discussion about magic and wonder in middle grade books with John August, Margaret Dilloway, and Kali Wallace, moderated by Sally Pla. The discussion will last 45 minutes, and the authors will be going directly to the signing area for book sales and signatures afterward. The San Diego Festival of Book is open to everyone. Tickets are $3 for each panel and can be purchased online. City of Islands is out in the world today! This is my third novel, and first for children, and I am so happy to finally be able to share it with you. It's a fantastical adventure of magic, mystery, and sea monsters, and I hope you--and all the younger readers in your life--enjoy it. If you're in the San Diego area, I'll be at Mysterious Galaxy on August 4 at 2 p.m. to talk children's books and fantasy. I would love to see you there! I will also most likely be making an appearance at the San Diego Festival of Books on August 25, but the details of that event have yet to be determined. I'll be sure to post the time and location as soon as I know. City of Islands has been a long time in the making, from my first stab at it during NaNoWriMo in 2010, and through many rewrites and revisions over the years that followed. I am proud of the book it is now, and I am so very thankful for everybody who has offered help and support along the way. There are exactly 50 days until the release of CITY OF ISLANDS, and I've got a roundup of trade reviews to share. I am delighted that reviewers are loving Mara and her strange, magical city, and I very much hope that means the book will find its way into the hands of kids who want to read an adventure full of sea monsters, sneaky mages, a whole bunch of sailing songs, excitement, and danger. 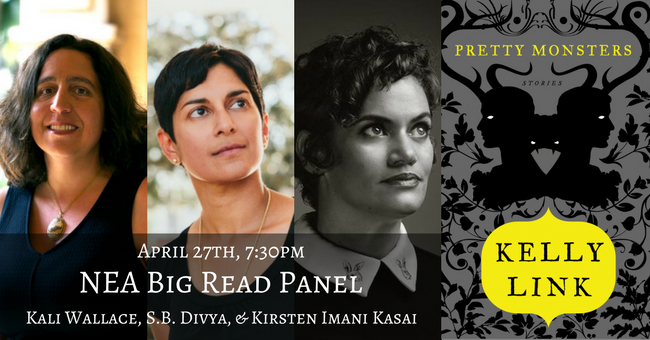 Friday, April 27 at 7:30 PM, I'll be participating in a panel at Mysterious Galaxy Bookstore in San Diego with fellow authors S.B. Divya and Kirsten Imani Kasai. We'll be talking about Kelly Link's wonderful short story collecting Pretty Monsters as part of the NEA Big Read program. The event is free and open to everyone! A starred review for City of Islands! CITY OF ISLANDS has received a starred review from Kirkus! "Wallace builds intrigue, layer by layer, page by page, until readers are glued to each word right up to the magnificent end. The captivating worldbuilding is supported by a sturdy third-person narrative that’s filled with people of various skin tones, personalities, and abilities who find a way to work together to right the wrongs of corruption.... Inspiration and excitement from beginning to end."